Replaces OE 56001390. Need More Jeep Parts ?. Bullet4 Limited 5 Year Warranty. Fits: Jeep Wrangler YJ 1987-1991. Orders are typically processed within 24 hours. Our goal is to provide top quality parts and accessories at rock bottom prices. Orders are typically processed within 24 hours. Helpful Links. Trending at $31.06eBay determines this price through a machine learned model of the product's sale prices within the last 90 days. Limited five year Manufacturer s warranty. Limited five year Manufacturers warranty. This part generally fits Jeep vehicles and includes models such as Wrangler with the trims of Base Sport Utility 2-Door, Islander Sport Utility 2-Door, Renegade Sport Utility 2-Door, Rio Grande Sport Utility 2-Door, S Sport Utility 2-Door, Sahara Sport Utility 2-Door, SE Sport Utility 2-Door. LED Lights. This product ensures your convenience onboard, such as connecting and charging, and it's super easy to install--- simply place it on board. Dust cover provides you with protection and will eliminate any risk that might occur to children. Limited five year Manufacturer s warranty. Limited five year Manufacturers warranty. This part generally fits Jeep vehicles and includes models such as Wrangler with the trims of Base Sport Utility 2-Door, Islander Sport Utility 2-Door, Laredo Sport Utility 2-Door, Renegade Sport Utility 2-Door, S Sport Utility 2-Door, Sahara Sport Utility 2-Door, Sport Sport Utility 2-Door. Review compatibility notes before purchasing. Car Racing Gauge. Tinted WHITE gauge face. 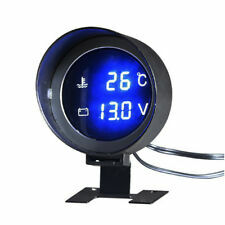 1 X Digital LED Volt Gauge. SILVER gauge ring. Blue Digital LED Readout. Car Key Accessories. Car Switches. Car Light Lamp. The gauge will both show the digital and analog LED. 1 Digital Volt Gauge. Car Light & Lamp. Car Accessories. Why Buy From us. (E.g. you brought wrong model or wrong color). LED 20 pcsred x 6 pcsyellow x 4 pcsgreen x 10 pcs. Fit: 12V-24V Car Motorcycle Boat Marine ATV RV Vehicles, etc. Car LED light. Say Goodbye to Exhausted Battery Before Each Drive! Display: blue led digital display. Get One for Your Vehicle, Well Know of Car! Power input: DC 12V/24V USB socket power output: DC 5V 4.2A. LED Light Color: Blue. Reads: 15v. 1 X Digital LED Volt Gauge. When powering up your Blue Digital gauge, the user will be alerted to a startup sequence to ensure your gauge is functioning properly. Each gauge includes all necessary mounting and installation hardware for installation. 1 X Digital LED Volt Gauge. Tinted WHITE gauge face. SILVER gauge ring. Blue Digital LED Readout. Led Strip Light. Car Light & Lamp. Car Accessories. New Arrival. Digital Gauge. 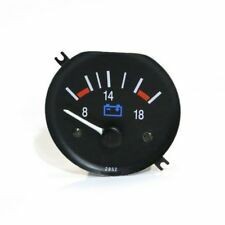 ---Car Racing Gauge. Pointer Gauge. Each gauge includes all necessary mounting and installation hardware for installation. 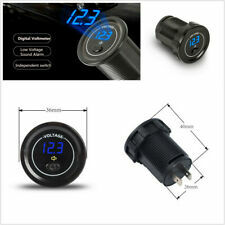 1 X Digital LED Volt Gauge. ---Car 12v Switch. ---Car Audio. ---Car Cigarette Lighter. Digital Gauge. 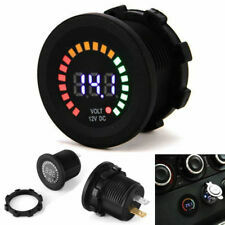 ---Car Racing Gauge. Pointer Gauge. 1 Digital Volt Gauge. ---Car 12v Switch. ---Car Audio. ---Car Cigarette Lighter. The gauge will both show the digital and analog LED. Super large input of up to DC 60V with Over-current， Over-volt and Short Circuit Protection, well protects the whole circuit, fits for most 12-24V Car Motorcycle ATV UTV RV Vehicles and Marine Boat. Fit: 12V-24V Car Motorcycle Boat Marine ATV RV Vehicles, etc. Suitable for Boat, marine, car and so on. Fits for most 12-24V Boat Marine Vehicle Motorcycle Truck ATV UTV Car Camper LED Round Panel. Say Goodbye to Exhausted Battery Before Each Drive! Display color :Blue. Input:12V DC. Range:5~15V DC. We will reply you within 24- 48 hours. Universal Car Alarm Start Security System Key Passive Keyless Entry Push Button Kit Black. - Can be matched your car alarm system or keyless entry system. 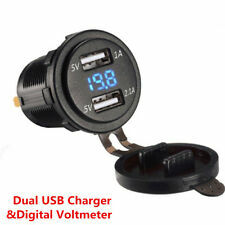 This item is only work with DC12V cars at the. Power outlet: DC 12V. About the switch hole, it could be used for a cigarette, cannot be used to light cigarettes. If you don't need the switch for a while, so enjoy it depend on what you would like it to been. Tire Gauge. 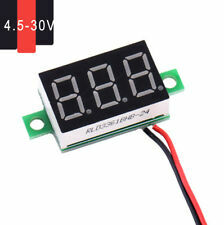 1 X Digital LED Volt Gauge. Tinted WHITE gauge face. SILVER gauge ring. Blue Digital LED Readout. LED Headlight. Car Seat Protector. We enjoy providing the highest quality, lowest price, best service on the market. 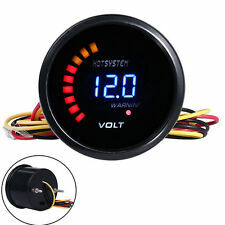 1 X Digital LED Volt Gauge. When powering up your Blue Digital gauge, the user will be alerted to a startup sequence to ensure your gauge is functioning properly. 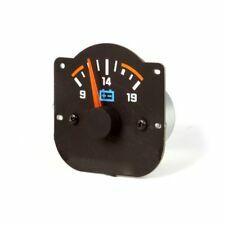 Each gauge includes all necessary mounting and installation hardware for installation. Output Current: 3.1A(one USB 2.1A,one USB 1A ). We will reply you within 24- 48 hours. Output Current: 3.1A(one USB 2.1A,one USB 1A ). 3 months Warranty. We will reply you within 24- 48 hours. If item is defective after 3 months, you can still send it back to us. We will send you a new one after receiving the defective item.